A compilation of visible and infrared images taken by LCROSS on August 17, 2009 of the Earth and its moon. North and the direction of the Sun are indicated by arrows. A NASA spacecraft has snapped new views of the Earth togetherwith its moon, which the spacecraft is scheduled to slam into in October. The pictures were taken about a week and a half before amalfunction caused LCROSS (Lunar Crater Observation and Sensing Satellite)to burn more than half of its remaining propellant. The $79 million LCROSS is carrying an empty Centaur rocketstage, which has about the same mass as a sports utility vehicle and will beslammed into the lunar surface on Oct. 9. The goal is to hit one of theshadowed craters found at the lunar south pole to see if water ice can be foundthere, as some scientists suspect. The new images were taken with the probe's visible lightcontext camera while LCROSS was flying about 323,296 miles (520,294 km) from the Earth and547,335 miles (880,850 km) from the moon. The Earth appears as a luminouscrescent in the images. 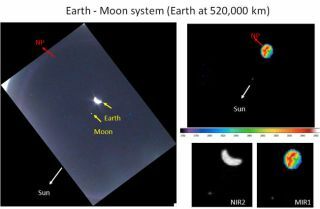 A single image was also taken with the probe's mid-infraredcamera , which revealed the Earth and moon in false-color hues. The probe's companion, NASA?s powerful Lunar ReconnaissanceOrbiter, will map the lunar surface in unprecedented detail. LCROSS is orbiting Earth twice on a long, elliptical route before it takes itssuicidal plunge, and is using that time to take a few snapshots of theplanet that launched it. The propellant malfunction means that LCROSS is dangerouslyclose to its fuel limits, which will likely mean that mission managers have tocancel some planned activities that are not crucial to the mission. This story was updated to correct the distance between LCROSS and the Earth at the time the new images were taken.